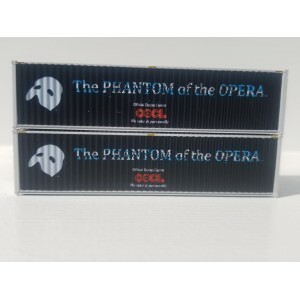 These were prototype containers, decorated for the 'Phantom of the Opera' show, as OOCL was the official Ocean carrier for the stage props for some years. A very unique and beautifully decorated model from recreated artwork. Compatible with JTC Retro-fit underframe kits to stack retrofitted M-T and S-T brand containers on top.